Bernardini, J., Licursi, D., Anguillesi, I., Cinelli, P., Coltelli, M. B., Antonetti, C., Galletti, A. M. R., and Lazzeri, A. (2017). "Exploitation of Arundo donax L. hydrolysis residue for the green synthesis of flexible polyurethane foams," BioRes. 12(2), 3630-3655. Flexible polyurethane foams were prepared from solid waste residue derived from the hydrothermal acid treatment of the Arundo donax L. herbaceous biomass, which produced a very high yield of levulinic acid. An innovative, sustainable, and green liquefaction route was adopted to produce lignin-based flexible polyurethane foams by partially replacing fossil-fuel source polyols with an abundant and renewable hydroxyl source, the Arundo donax L. “lignin-like” residue. Lignin liquefaction was performed in polyolic solvents using microwave irradiation, saving time and energy while ensuring a more sustainable and green approach. Foam production was performed with controlled expansion using the “one-shot” technique. Water was adopted as the only blowing agent, and the isocyanate index (NCO/OH) was kept to less than 100, which reduced the cross-linking degree of the desired foam and increased its flexibility. About 7 wt.% of the conventional petrochemical polyether polyol was replaced with the Arundo donax L. hydrolysis residue. The chemical and mechanical properties of the synthesized foams were compared with those obtained by using a pure technical soda lignin, ProtoBind 1000. The results were characterized by satisfactory mechanical properties, thus closing the biorefinery cycle of Arundo donax L. exploitation. Keywords: Flexible polyurethane foams; Microwave-assisted lignin liquefaction; Hydrochar; Arundo donax L.
Polyurethanes (PUs) are a wide class of polymers that are synthesized through a polyaddition reaction between polyols and isocyanate via a urethanic linkage (Hu et al. 2012). PUs are well known for their versatility, ranging from rigid up to flexible, such that they have many applications in the industrial production of foams, sheets, elastomers, adhesives, and paints. Foams, in particular, are commonly classified as rigid or flexible depending on their apparent density and mechanical performance, which can be modulated by the use of suitable reagents. Foams may consist of block copolymers, whose elastic and rigid properties depend on the balance between “soft” and “hard” domains, influencing the properties of the final material (Çayli and Küsefoğlu 2008). Flexible foams represent the largest market of polyurethane products and have applications in different strategic sectors, such as the furniture industry and automotive applications (seat cushioning, bumpers, and sound insulation) (Bellayer et al. 2016; Pan et al. 2016). The many reactions involved in PU foam production, such as those between isocyanate and water, amine, urea, urethane, and carboxylic acid, are summarized in Fig. 1 (Delebecq et al. 2013). Water is commonly used as a blowing reagent in PU foam formulation, due to the generation of carbon dioxide during the reaction of isocyanate with water (Fig. 1a). Alternatively, carboxylic acids can be used for the same purpose because they generate amides and carbon dioxide when reacted with isocyanates (Fig. 1e). Amines, with the exception of tertiary amines, can react with isocyanates to produce urea (Fig. 1b). Amines generally have a higher reactivity and react faster than alcohols. At temperatures higher than 100 °C, reversible reactions between isocyanate and urea/urethane occur, leading to the formation of biuret/allophanate (Fig. 1c and Fig. 1d). The production of flexible foams is the result of a careful balance between two kinds of reactions, “blowing” (or “swelling”) and “gelling” (or “cross-linking”), which favour the formation of open and closed structures, respectively. If “blowing” reactions are predominately occurring, the cells could be opened before the polymer has generated sufficient strength to maintain its stable cellular structure, resulting in a premature collapse of the foam. Comparatively, when gelling reactions are predominant, foams with completely closed cells can be obtained. Therefore, by taking into account the pathways reported in Scheme I, the reaction between isocyanate groups and water will release carbon dioxide, quickly producing polyurea segments, allowing for mixture expansion, thus giving the foam its particular swollen open-cell structure. Nearly all bio-based PUs have been produced from petroleum-based polyols and isocyanates. Diisocyanates and polyfunctional isocyanates with aromatic units are favored for the synthesis of PU foams because of their remarkably high reactivity, including toluene diisocyanate (TDI), methylene diphenyl diisocyanate (MDI), and polymeric MDI (pMDI). On the other hand, most polyols are petroleum-based so considerable efforts were developed towards bio-based polyols from renewable resources which may partially, or even totally, replace polyols from petrochemical sources. In this sense, many investigations have been carried out, starting from natural (Corcueraet et al. 2010; Hu et al. 2012) or epoxidized vegetable oils (Tu et al. 2009; Rojek and Prociak 2012; Zhang et al. 2014). As a very promising alternative to raw polyolic bio-materials, lignin can be used in the synthesis of polyurethane foams after a preliminary step of liquefaction to produce a liquid polyol mixture (Laurichesse and Avérous 2014; Bernardini et al. 2015a; Faruk and Sain 2016). Lignin is the second most abundant biopolymer after cellulose and is located in the cell walls of plants and woods. Its content depends on the type of wood (“softwoods” or “hardwoods”), ranging between 20 and 30 wt.%. Lignin is a highly branched aromatic polymer, mainly composed of 4-hydroxycinnamyl (p-coumaryl alcohol) units and its methoxylated derivatives in 3 and 3,5- positions (coniferyl alcohol and sinapyl alcohol, respectively) (Crestini et al. 2011), whose composition depends on the biomass source and on the reaction conditions adopted for the biomass pre-treatment (Lange et al. 2013). Due to its aromatic and aliphatic hydroxyl groups, lignin receives much attention in the field of polyester and polyurethane synthesis, with increasing reports on valorisation strategies (Stewart 2008; Borges da Silva et al. 2009; Ahvazi et al. 2011; Pan and Saddler, 2013; Percival Zhang 2013). Giant reed (Arundo donax L.) is one of the most exploitable lignocellulosic biomasses, thanks to its high content of terrestrial plant macroconstituents, e.g. cellulose, hemicellulose, and lignin (Shatalov and Pereira 2012). In this sense, the production of furfural and 2-hydroxymethylfurfural/levulinic acid by the acid-catalysed hydrolysis of C5 and C6 sugars represents an available and advantageous route for biomass exploitation (Ribechini et al. 2012; Raspolli Galletti et al. 2013; Antonetti et al. 2015; Galia et al. 2015; Raspolli Galletti et al. 2015; Antonetti et al. 2016). However, the sustainability of the hydrothermal route strongly depends on the exploitation of all biomass-conversion by-products, as well as its starting constituents. The main by-product coming from the hydrothermal treatment of the Arundo donax L. is the solid “lignin-like” residue, recovered downstream of the process by filtration. This fraction is mainly composed of partially depolymerized and reactive lignin and represents a considerable and abundant source for the entire process, amounting to 30 wt.% of the starting Arundo donax L. biomass, under the optimal reaction conditions for levulinic acid synthesis (Scordia et al. 2011; Shatalov and Pereira 2013; Licursi et al. 2015). In addition, this bio-material, also called “hydrochar”, is a by-product of any biomass thermo-chemical transformation process, such as pyrolysis and gasification. For these reasons, the valorisation of this degraded-lignin waste fraction is highly desirable and supported. While its exploitation has been limited to combustion for energy recovery, this fraction is a promising raw material for PU foam synthesis because it is a useful source of polyols. This work is focused on the innovative production of flexible PU foams starting from the lignin-like waste residue coming from the acid hydrolysis of the Arundo donax L. to generate levulinic acid. This sustainable approach is advantageous because abundant and low-cost herbaceous biomasses were used as raw materials. The exploitation of the Arundo donax L. hydrolysis residue as a lignin-rich source for PU production, instead of commercial kraft and soda lignins (Cinelli et al. 2013; Bernardini et al. 2015b), represents an innovative way to close the biorefinery cycle of the Arundo donax L. exploitation, which is currently restricted to the exploitation of the polysaccharide C5/C6 fraction to produce furfural/levulinic acid. Raw Arundo donax L. (A. donax) was provided by the Institute of Life Sciences Scuola Superiore Sant’Anna of Pisa. The biomass sample came from long term field trials carried out in Central Italy at the Enrico Avanzi Interdepartmental Centre for Agro-Environmental Research (CIRAA) of the University of Pisa, located in San Piero a Grado (PI). The raw biomass was dried at 60 °C in a thermo-ventilated oven until a constant weight was reached, and it was stored in a desiccator prior to its use. According to the official NREL methods (Sluiter et al. 2008a 2008b 2008c), the weight composition of the starting dry A. donax biomass was as follows: 65.3% structural polysaccharides (hemicellulose + cellulose), 26.1% lignin (24.3% as Klason lignin + 1.8% as acid-soluble lignin), 4.2% extractives, and 4.4% ash. Polyethylene glycol 400 (PEG 400) (Fig. 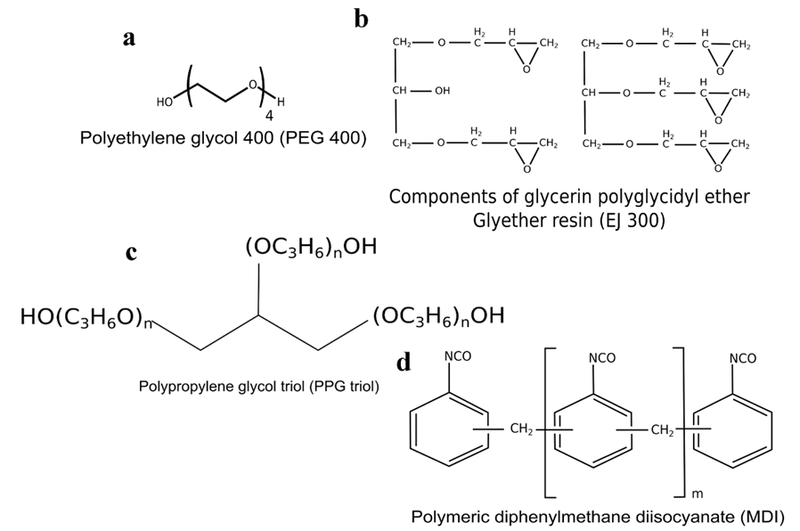 2a) and glycerol were purchased from Aldrich (Missouri, USA); glycerin polyglycidyl ether Glyether resin (EJ 300) (Fig. 2b) was purchased from JSI Group Ltd. (Hong Kong, China). These compounds were used as solvents for lignin liquefaction. Polypropylene glycol triol (PPG triol) (Fig. 2c), characterized by a molecular weight of 4800 Da, a functionality of 2.6, and viscosity of 850 mPa at 25 °C, was purchased from Sigma Chemicals (Missouri, USA), and it was used as polyol fraction (chain extender). The adopted isocyanate fraction was ISO 116/1, a polymeric diphenylmethane diisocyanate (MDI) with 25.7 wt.% of NCO content, kindly provided by BASF Poliuretani Italia Spa (Bergamo, Italy) (Fig. 2d). The isocyanate component was added in excess with respect to the polyols. This excess reacts with distilled water and forms carbon dioxide, which acts as the only blowing agent in the reaction mixture. The catalysts employed for the production of the polyurethane foams can be categorized into “gelling” and “blowing” catalysts. Both of these catalysts must be kept in proper balance to obtain the desired product. The catalysts used in this investigation were kindly provided by Air Products (Pennsylvania, USA) and belong to the new generation (NE), with low emission of amine: DABCO NE1070 (3-dimethylaminopropyl urea, “gelling” agent) and DABCO NE300 (N-[2-[2-(dimethylamino)ethoxy]ethyl]-N-methyl-1,3-propanediamine, “blowing” agent). These catalysts reduce emissions because the molecules that act as catalysts chemically bind themselves to the polyurethane matrix. DABCO DC2525, a silicone surfactant with 70 wt.% of polysiloxane (Air Products, USA), was used to ensure the entire structure uniformity and improve the cell opening. The hydrothermal treatment of A. donax biomass was performed in a 1 L Hastelloy C autoclave. The autoclave was equipped with a mechanical stirring system, a heating system consisting of three ceramic resistors (each of 500 W), and a thermocouple sensor for monitoring the temperature inner side of the autoclave. The process control was a P.I.D., and it was performed on the measurement of the absorbed electrical current by the three resistors. Finally, the autoclave was equipped with a cooling system to rapidly cool the reaction mixture. The biomass (40.7 g), water (582 g), and 37 wt.% HCl (23.25 mL) were introduced in the autoclave. It was closed and pressurized with 20 bar of nitrogen, heated to the reaction temperature (190 °C), and maintained at this temperature for 1 h. At the end of the hydrolysis reaction, the autoclave was cooled to room temperature and then degassed. The obtained suspension was filtered. The solid A. donax hydrolysis residue was washed with water up to neutrality, dried in an oven at 105 °C for 24 h, and then stored in a desiccator. The aqueous solution was analyzed by HPLC, as previously reported (Raspolli Galletti et al. 2012). where O is oxygen content, C is carbon content, H is hydrogen content, and N is nitrogen content. The selected dried lignin sample was mixed with liquefying reagents (glycerol and PEG 400/EJ 300) at the chosen concentration and placed in a Teflon vessel, where it was subjected to microwave irradiation in a multimode microwave oven CEM MDS 2100 (Bergamo, Italy). A power of 200 W was used to reach 50 °C in 2 min. Trials carried out reaching a higher temperature made the colour of the liquefied system darker, and for this reason, the final temperature was thoroughly controlled. The microwave-heated mixture was liquefied and used as the polyol component with the isocyanate, which was added to the desired isocyanate index. In the adopted “one-shot” route, the above components were mixed together with the chain extender, the catalysts, and the surfactant. The weigh amount (g) of the different components used in the mixtures are reported in Table 1 (where the compositions of 5 basic mixtures is reported) and Table 3 (where the composition of the five basic mixtures was varied in terms of Isocyanate Indices). The obtained liquefied mixture was deposited into an 85 x 85 x 55 mm mould, which was closed in order to get a controlled expansion. The foams were kept at room temperature for 3 days and then characterized (Cinelli et al. 2013; Bernardini et al. 2015a). where MNCO is the number of isocyanate groups in one gram of isocyanate, WNCO is the weight of isocyanate (g), MOH is the number of hydroxyl groups contained in one gram of polyol (mixture of liquefied lignin and chain extender), WHO is the weight of polyols (g), MAd is the number of hydroxyl groups in one gram of additives (blowing catalyst, index 1, gelling catalyst, index 2, and surfactant, index 3), WAd is the weight of additives (g), and WH2O is the weight of water. Thermogravimetric analysis (TGA) of polyurethane foam was carried out following the ASTM standard procedure D3850-06 (2006), using a Rheometric Scientific instrument (TGA 1000, New Jersey, USA). The samples were milled and heated from room temperature up to 900 °C at a heating rate of 10 °C/min, under standard atmospheric pressure. For dynamic mechanical analysis (DMTA), polyurethane foam was cut into 20 x 20 x 20 mm cubes and tested using a Gabo Eplexor 100 N instrument (Ahlden, Germany), which compressed the foam between two serrated parallel plates that were 25 mm in diameter. The storage modulus (E’) and tan δ were recorded at a frequency of 1 Hz from -150 to 120 °C, with a heating rate of 2 °C/min. The density and the 50% compression force deflection value (CFDV) of flexible polyurethane foam were measured following the Standard Test method ASTM D3574-05 (2005) adopted for the characterization of flexible cellular materials, which includes slab and moulded urethane foams. The compression force deflection test was performed using an Instron 1185 device (Massachusetts, USA), as previously described (Bernardini et al. 2015a). The sample size was 30 mm x 30 mm x 30 mm, and a minimum of three replicates for each sample were tested. Compression strength was evaluated as the ratio between the final load at 50% of specimen thickness compression after 60 s and the cross section area of the specimen (mm2). FT-IR characterization of the polyurethane foams was performed by a Perkin Elmer Spectrum-One spectrophotometer (Massachusetts, USA), equipped with an attenuated total reflectance ATR apparatus. The foams were dried at 105 °C for 2 h before analysis to ensure that no adsorbed water was present. A scanning electron microscope (SEM) (Jeol JSM5600LV, Tokyo, Japan) was used for PU foam microstructure investigation. Gold sputtering was applied using an Edwards Sputter Coater (West Sussex, United Kingdom). The homogeneous, acid-catalysed, and hydrothermal exploitation of the Arundo donax L. (A. donax) hemicellulose and cellulose fractions produced furfural (FA) and levulinic acid (LA), two very interesting platform chemicals of industrial interest (Raspolli Galletti et al. 2009; Raspolli et al. 2012; Licursi et al. 2016). This process allowed hemicellulose fraction solubilization/conversion to FA under mild reaction conditions. Under more severe reaction conditions, the cellulose fraction became solubilized/converted to LA. Hydrochloric acid was the most suitable catalyst because the volatile acid enabled a simple recovery of the produced LA by atmospheric/vacuum distillation and steam stripping, which also allowed for the retrieval of about 95% of the acid catalyst to be recycled. The scheme of the fractionation of the A. donax components is reported in Fig. 3. By choosing pathway A, it is possible to recover FA after the initial mild hydrolysis step, and LA in a second hydrolysis step carried out under more severe reaction conditions. Instead, pathway B allows for the direct production of LA without the intermediate FA recovery, the latter being completely converted into condensation products, or humins, which are incorporated into the final solid lignin-like hydrolysis residue (Van Zandvoort et al. 2013; Licursi et al. 2015). To monitor FA and LA yield during the hydrothermal process, pathway A was studied, and the main reaction parameters were optimized, which included the type and concentration of acid catalyst, hydrolysis temperature, time, and solid/liquid ratio (Raspolli Galletti et al. 2012). Under the optimized reaction conditions, very high yields of FA and LA were obtained compared to the starting dry biomass, amounting to about 8 to 10 wt.% and 20 to 23 wt.%, respectively, as reported in Fig. 4. These results are remarkable compared with results in the literature (Rackermann and Doherty 2011). At low hydrolysis temperatures (120 to 140 °C), only a small amount of the A. donax biomass became soluble and was converted into FA, 5-HMF and LA (Fig. 4). The solubilization of C5 and C6 sugars and their subsequent conversion to FA, 5-HMF, and LA were increased by raising the temperature. However, pathway B allowed for the one-step production of high yields of LA without FA recovery, involving a simpler process approach devoted to a simple platform chemical (LA) production from carbohydrates. Besides lignin and FA degradation products, the obtained solid residue contained 5-(hydroxymethyl)furfural (5-HMF) condensation products coming from C6 sugar dehydration. Consequently, the solid residue recovered following approach B was more complex and rich with degradation products, representing an “extreme” but very intriguing residue to be exploited. This solid can be successfully used with residual lignin fraction because of its remaining free hydroxyl and carbonyl groups. Taking into account the co-production of LA in high yields following pathway B, this route was chosen, and the obtained solid residue was efficiently tested for polyurethane foam production, adding surplus value both to the solid material and to the entire process. 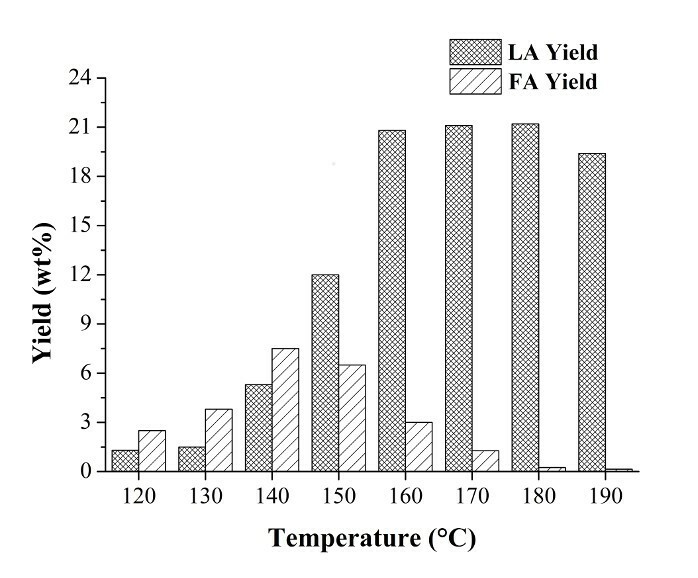 Figure 4 shows that using a high hydrolysis temperature (180 to 190 °C), FA was completely converted into furanic degradation products, with a maximum LA yield of 20 to 23 wt.% (Path B). The solid waste of this process was a biochar (Lehmann and Joseph 2009), obtained by hydrothermal carbonisation (HTC) at a low temperature (200 °C). It is more aptly named hydrochar because it simulates the natural coalification process at accelerated rates (Titirici et al. 2007; Sevilla and Fuertes 2009; Hu et al. 2010; Licursi et al. 2015). In Fig. 5, the yield in A. donax hydrolysis residue is reported (as wt.%) as a function of the hydrolysis temperature. 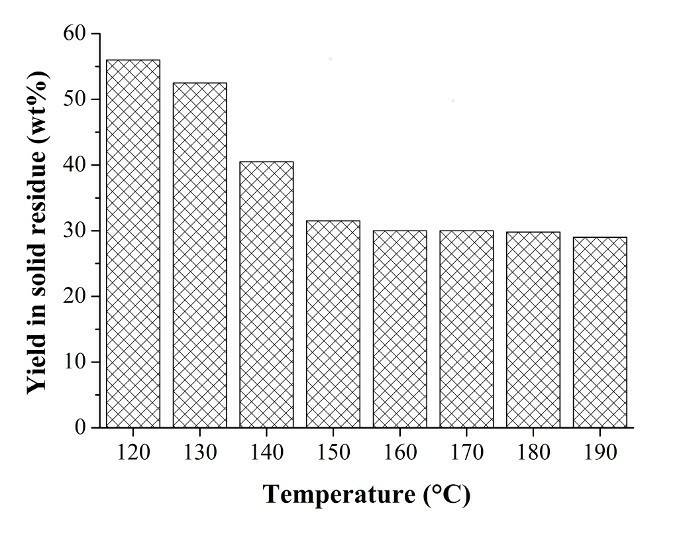 A. donax hydrolysis residue represented a considerable percentage of the residue (30 wt.%) with respect to the weight of the starting biomass in the optimal temperature range for LA synthesis (e.g., 180 to 190 °C). For this reason, the exploitation of this “lignin-like” waste fraction is necessary for completing the A. donax biorefinery cycle. In a previous work, A. donax hydrolysis residue was characterized and compared with ProtoBind 1000, a technical soda lignin used for the synthesis of polyurethane foams (Bernardini et al. 2015a, b). It was found that A. donax hydrolysis residue had a brown coal lignite-like elemental composition (C: 63.6%, H: 4.3%, N: 0.7%, O: 31.4%). Dehydration and condensation reactions occurred at a high degree and only a small amount of lignin fragments could be recovered by solvent extraction. Furthermore, a lignin soluble fraction included low-molecular lignin fragments, with a low content of methoxyl and aliphatic hydroxyl groups, consisting mainly of p-hydroxyphenyl lignin units. The A. donax hydrolysis residue also contained C5-derived humins, which accounted for at least 8 to 9 wt.%, i.e., the concentration of furfural coming from A. donax hemicellulose conversion, which was no more than the amount present in the liquid phase at the optimal temperature for LA synthesis, 190 °C (see Fig. 4). C6-humins coming from 5-hydroxymethylfurfural condensation reactions were included in this solid residue. Ultimately, the thermally degraded A. donax hydrolysis residue was a carbonaceous “lignin-humin-like” bio-char. However, ProtoBind 1000 soda lignin had a “Type III” kerogen (peat) coal-like elemental composition (C: 56.8%, H: 6.0%, N: 0.85%, O: 36.35%). This kind of technical lignin was almost completely soluble in organic solvents, suggesting that it was extremely pure and that it still had its methoxyl, aliphatic, and aromatic hydroxyl groups. The optimization procedure for ProtoBind 1000-based polyurethane foam synthesis was applied to A. donax hydrolysis residue-based foam. This innovative approach allowed fast, efficient, and direct mixing of all components in a single stage. Fig. 6 shows the adopted “one-shot” technique. The synthesis of polyurethane foam required a low viscosity system, e.g., a mixture of glycerol and PEG 400 as solvent for lignin liquefaction (Cinelli et al. 2013), thus obtaining an optimal formulation, named ARH. PEG 400 was replaced with the EJ 300, a mixture of glycerol polyglycidyl ethers. The amount of EJ 300 was altered and tested, creating two mixtures named ARF and ARJ using the reported procedure (Bernardini et al. 2015a). By lowering the isocyanate index, the lignin content in the final foam was maximized, and foams with stable structures were obtained. 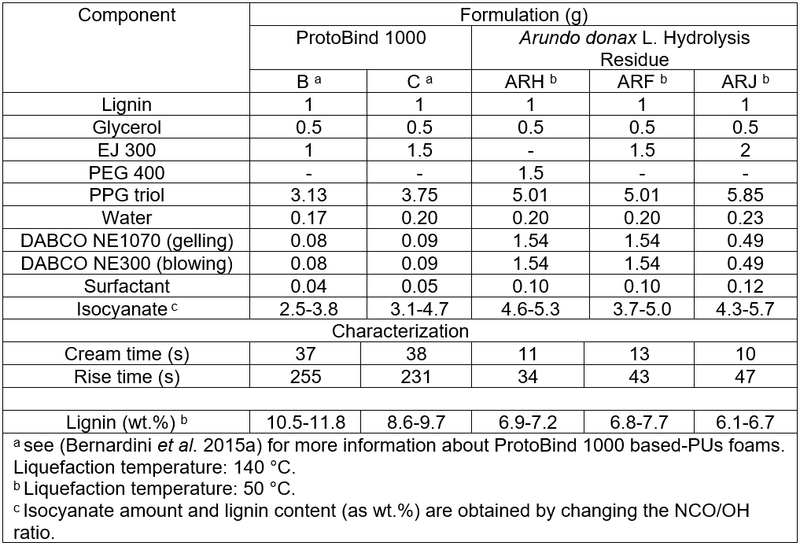 The compositions of ProtoBind 1000- and A. donax hydrolysis residue-based formulations are reported in Table 1. Table 1 shows that the deep structural difference between the two investigated lignin sources strongly influenced their liquefaction tendency. Due to the noticeable reluctance of the A. donax residue to undergo liquefaction, the relative amount of EJ 300 or PEG 400 to glycerol required for A. donax residue liquefaction in some formulations was significantly higher than that required by the ProtoBind 1000 lignin. This can be attributed to the “coal-like” behavior of the A. donax hydrolysis residue, resulting in a lower solubility, even in stronger solvents. Because commercial ProtoBind 1000 lignin is an un-degraded and pure lignin, it is almost completely soluble in mild organic solvents such as CHCl3 or inorganic NaOH (this lignin comes from soda extraction). These chemical differences also influenced the maximum adopted liquefaction temperature, which was much higher for ProtoBind 1000 formulations than for A. donax hydrolysis residue (140 compared to 50 °C, respectively). Beyond 50 °C, the A. donax hydrochar definitively carbonized. The low content of aliphatic hydroxyl groups (AlkOH) and the high content of aromatic hydroxyl groups (ArOH) in the residual free (e.g., not-condensed), low-molecular weight lignin units of the A. donax hydrolysis residue were responsible for the higher amount of the chain extender (PPG triol) adopted in the investigated formulations. The higher amount of the chain extender reduced the viscosity of the liquefied mixture, which was originally high because of the low solubility of the A. donax hydrolysis residue. Ultimately, the A. donax hydrolysis residue based-liquefied mixture was a solid-liquid suspension. The mechanism proposed for ProtoBind 1000 liquefaction is reported in Fig. 7. Both EJ300 and glycerol participated in lignin liquefaction by breaking C-O linkages that lead to the formation of lignin fragments, and by forming flexible linkages consisting of EJ300 and glycerol on the solid lignin surface. Thus, ProtoBind 1000 based-liquefied formulation does not contain free epoxide groups because hydroxyl groups were in excess, and the adopted liquefaction temperature (140 °C) was higher than 70 °C (Verborgt and Webb 2007). The presence of polyepoxide-lignin adducts explains the higher flexibility of the foams derived from these liquefied samples. Figure 8 reports the proposed mechanism for the liquefaction of A. donax hydrolysis residue. 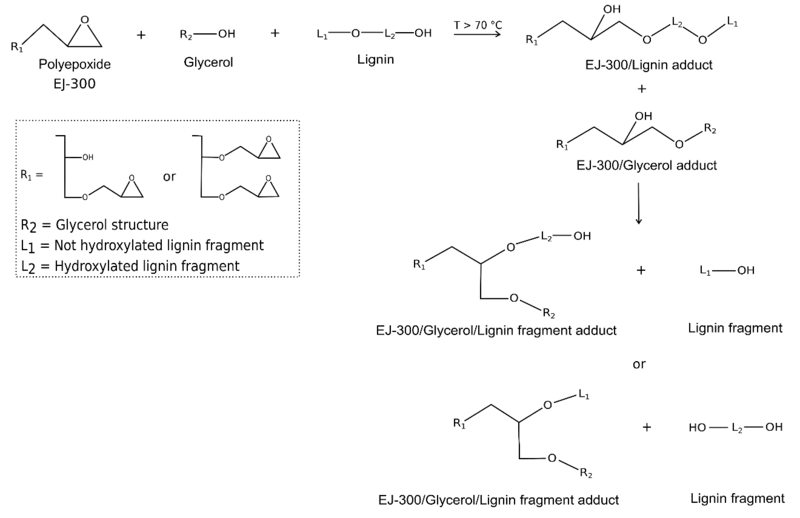 In the proposed mechanism, glycerol is responsible for A. donax residue liquefaction, which resulted in glycerol/lignin fragment adduct and lignin fragments. Because of the lower temperature adopted for the liquefaction (50 °C), epoxide rings of EJ 300 solvent only partially opened during the liquefaction treatment. Hence, there is a high probability that un-altered epoxide rings were present in the reactive mixture after liquefaction. The liquefaction occurs because of the nucleophilic attack of glycerol, and lignin fragmentation is reduced because the main component of the liquefying mixture, EJ 300, is only partially active (Bernardini et al. 2015a). Therefore, the final liquefaction mixture included both liquefied and suspended A. donax hydrolysis residue in the EJ 300 solvent. Polyurethane foams were synthesized starting from A. donax hydrolysis residue. Initially, the OH number of the starting liquefied mixture was determined. This parameter should be as low as possible to minimize the amount of cross-linked foam produced. The results are reported in Table 2, where they are compared with the results from the ProtoBind 1000 formulations (“B” and “C”). The PEG 400-based foam (ARH) had a higher OH number. This result was due to different degrees of functionality in terms of the hydroxyl groups (Fig. 2a) of this polyol (completely terminated by hydroxyl groups). On the contrary EJ300 contains mainly epoxidized group (Fig. 2b) and, as the liquefying reaction occurs at a temperature lower than 70°C, reasonably this groups are present in epoxydic form, thus not contributing to the increase of OH number (Figs. 7 and 8) in liquefied lignin. 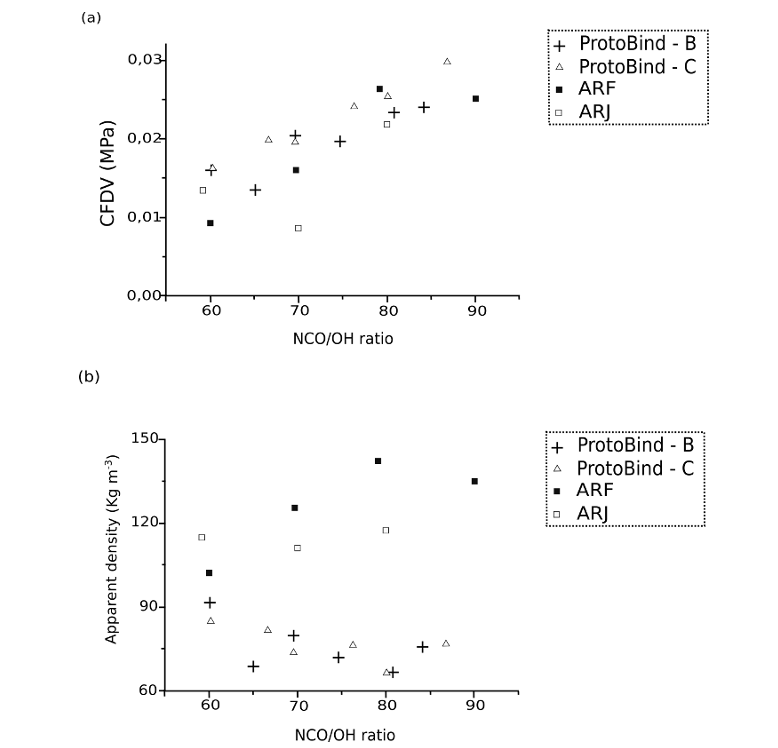 Moreover the OH number of liquefied Protobind lignin (samples B and B) is slightly lower because Protobind lignin has in general a lower OH content than A. donax residue (Licursi et al. 2015). By considering the ARF and ARJ formulations, the amount of EJ 300 did not significantly modify the final hydroxyl number. The OH numbers of the A. donax formulations were always higher than the OH numbers of the ProtoBind 1000 formulations. This is due to a higher degradation of the A. donax hydrolysis residue, which led to the desired fragmentation of the residual free lignin units, despite the unwanted condensation reactions among lignin units. The OH number was also evaluated after the addition of the chain extender (PPG triol) to the formulations of interest; these data are reported in Table 2. The addition of the chain extender decreased the OH number by about 60% with respect to the starting liquefaction mixture; this is a result of the dilution of hydroxyl groups. The addition of PPG triol did not significantly modify the previously observed trend, further demonstrating that EJ 300 formulations (ARF and ARJ) produced the most promising results. On the basis of the determined OH number, the isocyanate index was fixed, and the weight of isocyanate was established and employed in each formulation. An isocyanate index lower than 100 was adopted to maintain a low cross-linking degree of the final foam (Pawlik and Prociak 2012), giving the material a high flexibility. Isocyanate indexes between 80 and 60 were precisely employed. The ARH foams, which were obtained in the presence of the PEG 400 liquefying agent, structurally collapsed when NCO/OH index was over 80 or below 70. Table 3 shows the isocyanate index and lignin content (wt.%) of A. donax hydrolysis residue based-formulations. It was possible to obtain foams with a higher content of lignin when liquefied ProtoBind lignin was used instead of the A. donax residue. Moreover, by lowering the NCO/OH ratio (i.e., reducing the amount of the added isocyanate), the lignin content was increased in the final material. However, as previously stated, the structure of the obtained ARH foams collapsed, so formulations based on EJ 300 were further investigated. The kinetics of the formation of the foam was monitored by means of “cream” and “rise” time parameters, which are reported in Table 1 for both A. donax hydrolysis residue and ProtoBind 1000 based-formulations. The “cream” time was the time required by the polyurethane mixture to switch from a clear colour to a creamy colour. Even though the liquefied A. donax hydrolysis residue had a very dark-brown colour, it was possible to recognize the change in colour when cream time was reached. The rise time was required for the complete expansion of the foam. Cream time did not result in a discriminating parameter because of the similarity among all the data. Instead, rise time for the ARH formulation was much lower than those of the remaining formulations. This is due to the higher molecular weight of PEG 400 (Fig.2). This implies that EJ300 requires more time for cross-linking completion. Cream and rise time of the A. donax hydrolysis residue based-formulations were much shorter than those of the ProtoBind 1000, thus confirming that the lignin soluble fraction of the A. donax hydrolysis residue was highly fragmented and contained free reactive hydroxyl groups. The synthesized polyurethane foams were characterized by the FT-IR technique. This spectroscopic investigation assessed the presence of unreacted isocyanate within the final material and evaluated the formation of typical urethanic linkages. Figure 9a reports the FT-IR spectra of the foams obtained for the same ARF formulation, but at different isocyanate indices. In Fig. 9b, the FT-IR spectra of the polyurethane foams, derived from different formulations at the same isocyanate index value of 70, are reported and compared with the spectra of ProtoBind 1000-based samples, including these last ones characterized by an isocyanate index of 70. The main absorption band of the un-reacted isocyanate group -NCO was at 2270 cm-1 (Cole et al. 1987); when it was no longer present in any foam, the reaction between the added isocyanate and the polyol groups of the mixture was complete. The typical absorption band of the urethanic bond was observed as the –NH vibrational stretching between 3500 and 3200 cm-1 (Tsai et al. 1998) and the characteristic stretching vibration of –C=O groups between 1750 and 1600 cm-1. Three absorption bands were found; the first one was at ~1550 cm-1 and was due to–CN urethanic linkages (Rashmi et al. 2013). The remaining wavelengths at 1620 and 1730 cm-1 were due to C=O stretching, suggesting a phase separation in the bio-material (Zhang et al. 1998). The absorption band at 1620 cm-1 was characteristic of bidentate urea, which interacts with the surrounding molecules through hydrogen bonds, whilst that at 1730 cm-1 was due to free urea. Hydrogen bonds of urea, and either bidentate or monodentate indicate the presence of hard domains within the foam structure. In addition, the absorption bands below 1500 cm-1 fall in the fingerprint region of the polyurethane foam (Lopes et al. 2012). Fig. 9. (a) Comparison among FT-IR spectra of the ARF polyurethane foams, obtained at different isocyanate index. 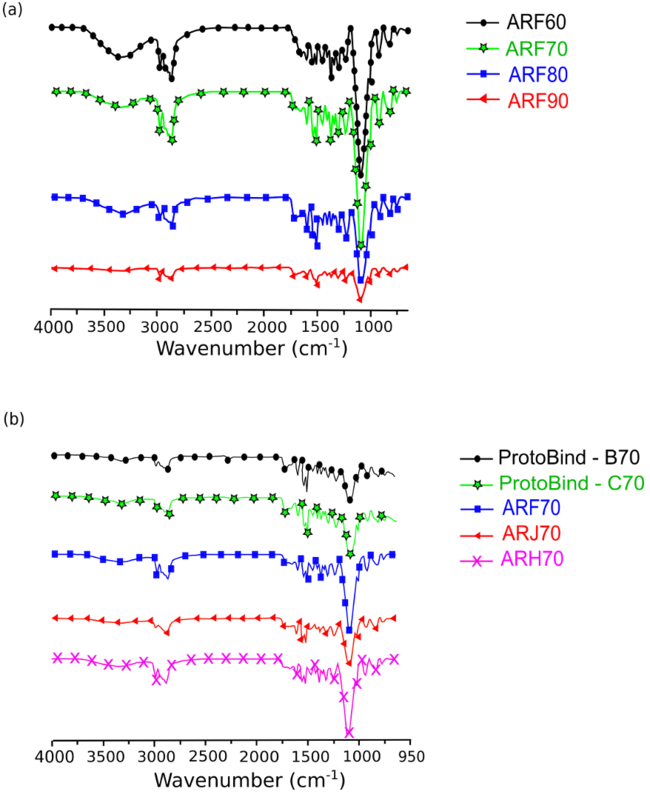 (b) Comparison among FT-IR spectra of Arundo donax L. hydrolysis residue- and ProtoBind 1000-based polyurethane foams, at constant isocyanate index (NCO/OH = 70). ProtoBind 1000 formulations are named “B70” and “C70”). The overall comparison among the FT-IR data qualitatively suggested that polyurethane foams can be obtained starting from the A. donax hydrolysis residue, regardless of the chosen isocyanate index. Thermogravimetric (TG) analysis is used to investigate the thermal behaviour of polyurethanic materials (Petrović et al. 1994; Hablot et al. 2008). Figure 10a and 10b show the TG and differential TG (DTG) curves of A. donax hydrolysis residue and ProtoBind 1000-based foams, all obtained with a NCO/OH ratio of 70. Figures 10a and 10b show two main thermal degradation steps. The first one at 270 °C was due to the thermal degradation of urethanic bond. Usually mass losses at 390 and 490°C have been attributed at soft (due to chain extender) and hard (due to liquefied lignin) segment, respectively (Bernardini et al. 2015b). Hence, the peaks at 520 °C can be attributed to the polyurethanic chain hard-domains (Satheesh Kumar and Siddaramaiah, 2007). However, a different behaviour of the urethanic bond thermal degradation occurred in the investigated formulations. The thermal degradation of the PEG 400-based foams (ARH) occurred at a higher temperature (ΔT~50 to 60 °C) than those that were EJ 300-based. This was due to the lower functionalization degree of PEG 400. Finally, as stated above, the peak at 500 °C was due to the thermal degradation of polyurethane rigid domains. The investigated foams showed a similar profile for this peak, excluding the ARH formulation (PEG 400-based), which showed a completely different DTG profile. 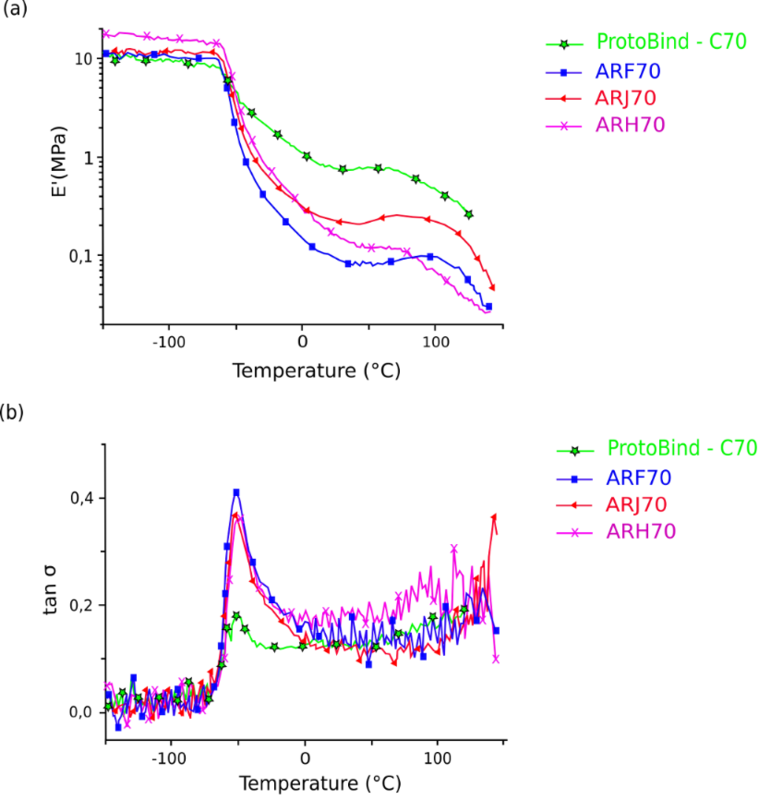 The ARH70 sample was characterized by a higher degradation temperature, demonstrated by the first peak, and the soft domains created by the higher thermal resistance of PEG compared with EJ 300. Moreover, the second mass loss related to the rigid domains for ARH70 sample was less evident because of the more flexible structure of this material. This difference had an impact on the mechanical properties, as described in the following paragraphs. Fig. 10. 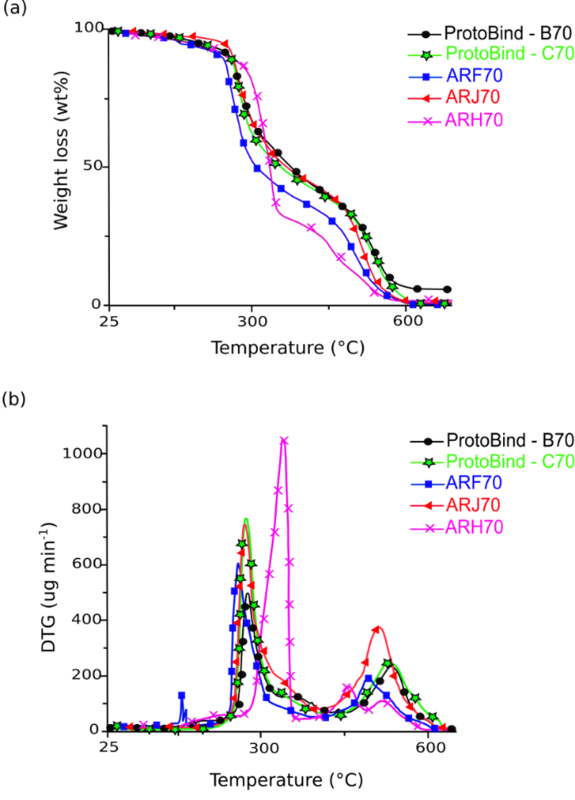 TG (a) and DTG (b) curves of the investigated polyurethane foams based on Arundo donax L. hydrolysis residue (ARF, ARH and ARJ) and ProtoBind 1000 (B and C). The thermograms were acquired at constant heating rate (10 °C min-1), under air atmosphere. Dynamic mechanical thermal analysis (DMTA) of A. donax hydrolysis residue based-polyurethane foams was performed according to the procedure previously reported (Bernardini et al. 2015a). Figures 11a and 11b show the storage modulus (E‘) and tan δ data, as a function of the temperature, respectively. The glass transition temperature Tg of each sample was determined by the tan δ peaks. In these graphs, data for ProtoBind 1000 based-foam (“C” formulation) are reported for comparison. As expected, two different transitions are shown in Fig. 11a. The first one is due to the presence of soft domains, and the second one is due to hard ones. Both domains presented their own mechanical stiffness and Tg values (Huh and Cooper 1971). The soft phases (also called polyol-rich phases), which gave the foam its typical visco-elastic properties, had low Tg, ranging between -70 and -50 °C. In contrast, the polyurea-rich hard domains, which conferred to the foam greater modulus and thermal stability, had a higher glass transition temperature (~100 °C). These similar trends are indicative of a similar phase separation between hard and soft domains (Aneja and Wilkes 2002), regardless of the polyolic reagents and their weight concentration. In agreement with previous work (Bernardini et al. 2015b), the type of chain extender was the main parameter affecting the glass transition temperature of the soft domains, as all formulations were synthesized using PPG triol, which showed similar values of Tg at about -50 °C. Figure 11a shows a non-linear plateau for the A. donax hydrolysis residue-based polyurethane foams, starting from 30 °C. This behaviour is different from kraft and soda commercial lignins (Cinelli et al. 2013; Bernardini et al. 2015a), which instead were quite linear. These imperfections are due to the irregular structure of the A. donax hydrolysis residue that affected the properties of the final foams. The plateau is due to the breakage in the physical cross-links inside the polyurethane network that caused the plateau to end and repercussions on the storage modulus to decrease (Eceiza et al. 2008). The end of the plateau corresponds to the maximum temperature for the material application; this temperature was higher for the foams produced using EJ 300 as polyolic reagent (ARF and ARJ), further confirming the promising results obtained for the ARF formulation. The glass transition temperatures of the A. donax hydrolysis residue based-foams were similar to the ProtoBind 1000-based foams, meaning that phase separations between hard and soft domains were practically analogous, regardless of the different starting lignin material. ProtoBind 1000-based foam showed higher values of storage modulus, which corresponds to greater foam sturdiness. The tan δ curves of each formulation, as well as modulus profiles, had similar Tg values (about -50 °C), as shown in Fig. 11b. However, the formulations had different tan δ peak heights. This parameter is correlated to the amount of soft domains within the polymeric chain. The EJ 300-based formulations had more intense peaks, meaning that a greater amount of soft domains were included in the chain network. This resulted in a greater flexibility of EJ 300-based foams and, consequently, a better mechanical performance. The apparent densities of PUs deriving from ARF and ARJ formulations are reported in Table 4. There was a linear correlation between isocyanate index and apparent density for the foams derived from the ARF formulation. The foam derived from the ARJ formulation did not show the same increasing trend, probably because of the higher amount of EJ300. In this case, because the epoxide group content was higher, the system was less sensitive to the isocyanate content. Despite this evidence, the ARJ formulation displayed a good compression force deflection value (CFDV), which is defined as the force necessary to produce 50% of the sample thickness compression by applying the force over its entire surface area. This parameter is an index of flexibility that increases with foam stiffness (Bernardini et al. 2015b) and depends on the total lignin content in the final bio-material, which leads to an increase of the polyurethane chain stiffness. Higher CFDV values indicate that foam is sturdier, which occurs with a higher cross-linking density and a greater apparent density. Figure 12a reports the CFDVs as a function of the isocyanate index NCO/OH for the A. donax hydrolysis residue and ProtoBind 1000-based foams. Figure 12b reports the apparent density of these foams as a function of their isocyanate index. Figure 12a expresses a direct correlation between the isocyanate index and compression force deflection value (CFDV) for the different formulations of A. donax hydrolysis residue- and ProtoBind 1000-based foams. To improve the foam resistance, it is therefore possible to increase the isocyanate index, e.g., the foam reticulation degree, and ultimately increase its compression strength. At a constant isocyanate index, all A. donax hydrolysis residue based-formulations showed lower compression force values than the ProtoBind 1000 based-formulations. The decrease in the structural stability of the A. donax hydrolysis residue based-foams was due to the more degraded nature of the starting lignin-source, which agreed with the chemical characterization. Figure 12b confirms that the considerable differences between the starting lignin-materials had deep repercussions on the chain extension of polyols in the liquefied polyol mixture, which in turn conveyed the reactions of isocyanate. Taking into account the A. donax hydrolysis residue-based foams, the increase of both apparent density and isocyanate index is related to the reaction of isocyanate groups with hydroxyl and epoxy groups, which forms cyclic oxazolidones (Smith 1963). These intermediates are responsible for the stiffness of the foam. In contrast, Protobind 1000-based foams exhibited a decrease in the apparent density by increasing NCO/OH. This is due to the absence of epoxy groups that have been opened by the polyol reagents during the liquefaction step. Therefore, isocyanate had not formed an oxazolidone group, but it had reacted with water and formed carbon dioxide, which created a lower apparent density foam. A further relevant parameter to check during the optimization of the polyurethane foam formulation for the packaging sector is the thickness lost in the second compression step with respect to the first. All formulations presented an average value lower than 2.2%, which is in agreement with the accepted standard for the marketing of flexible polyurethane foams as packaging materials and with the acceptable elasticity of the foam. From a commercial standpoint, flexible polyurethane foams should have a CFDV value between 0.01 and 0.07 MPa, and on this basis, only the ARF formulation met these requirements. These foams gave better results due to the decreased amount of adopted liquefaction solvent, as previously stated. Scanning electron microscopy (SEM) was used to characterize the morphology of polyurethane foam because the mechanical properties are primarily influenced by the apparent density, thickness, and size of the open-cells (Gibson and Ashby 1997). This technique was used to observe open-cell structures, which are typical of flexible polyurethane foam. SEM micrographs of the three investigated A. donax hydrolysis residue- based foams characterized by an isocyanate index of 70 are shown in Fig. 13. As expected, all investigated formulations had open-cell polyhedral structures. The foam cell shapes showed a preferential orientation towards foam rise. By increasing the amount of the liquefaction solvents, an increase in size and number of open-cells was observed. Furthermore, opening cell process strictly influences the formation of ureic aggregates (Rossmy et al. 1981). However, in this case, only a small amount of the intercellular membranes of the polyurethane foams was completely broken because of the presence of many impurities in the A. donax hydrolysis residue. Therefore, irregular structures were obtained. Figure 14 shows SEM micrographs of the ARJ formulation at different isocyanate index. Decreasing the isocyanate index resulted in more open-cell structures with slightly higher cell sizes, at the expense of greater irregularities, as shown in Fig. 14. This result was in agreement with the well-known behaviour of flexible polyurethane foams (Rossmy et al. 1981). A novel green synthesis of flexible polyurethane foams was developed using Arundo donax hydrolysis residue as a lignin source, after the exploitation of its cellulose fraction to give levulinic acid with high yields in a single step conversion process. The synthetic approach was based on a previously developed and optimized method, which was applied to the commercial ProtoBind 1000 soda lignin. Microwave radiation allowed for a fast partial liquefaction of the Arundo donax hydrolysis residue at low temperatures. Glycerol and EJ 300/PEG 400 were used as liquefaction solvents. The foaming process was performed under controlled expansion, using water as the only blowing agent, thus tailoring the properties of the final foam. These foams were produced by a “one-shot” approach, with an isocyanate index lower than 100, in order to increase the flexibility of the final bio-material. The amount of lignin in the Arundo donax hydrolysis residue based-formulations was raised to ~ 7 wt.%. All foam formulations had apparent density between about 100 and 140 kg m-3, a CFDV value between 0.50 × 10-2 and 2.50 × 10-2 MPa, and an average thickness loss lower than 2.2%. These properties are suitable for packaging applications, such as packaging of furniture or as interior parts of car seats. The production of polyurethane foams closes the biorefinery cycle of Arundo donax exploitation after conversion of polysaccharide fractions to valuable platform molecules. Dr. N. Nassi of the Scuola Superiore Sant’Anna is gratefully acknowledged for helpful discussions. Antonetti, C., Licursi, D., Fulignati, S., Valentini, G., and Raspolli Galletti, A. M. (2016). “New frontiers in the catalytic synthesis of levulinic acid: From sugars to raw and waste biomass as starting feedstock,” Catalysts 6(12), 196-224. DOI:10.3390/catal6120196. ASTM D3850 – 94 (2006). “Standard test method for rapid thermal degradation of solid electrical insulating materials by thermogravimetric method (TGA),” ASTM International, West Conshohocken, USA. ASTM D3574-05 (2005). “Standard test methods for flexible cellular materials—Slab, bonded, and molded urethane foams,” ASTM International, West Conshohocken, USA. EN 15104 (2011). “Solid biofuels – Determination of total content of carbon, hydrogen and nitrogen,” European Committee for Standardization, Brussels, Belgium. Faruk, O., and Sain, M. (2016). Lignin in Polymer Composites, Elsevier, Amsterdam, the Netherlands. Gibson, L. J., and Ashby, M. F. (1997). Cellular Solids: Structure & Properties, University Press, Cambridge, United Kingdom. Lehmann, J., and Joseph, S. (2009). Biochar for Environmental Management: Science and Technology, Earthscan Publications, London, United Kingdom. Raspolli Galletti, A. M., Antonetti, C., De Luise, V., Licursi, D., and Nassi o Di Nasso, N. (2012). “Levulinic acid production from waste biomass,” BioResources 7(2),1824-1835. Raspolli Galletti, A. M., Ribechini, E., Martinelli, M., Bonari, E., and Nassi o Di Nasso, N., Angelini, L. (2009). “Process for the complete and efficient exploitation of giant reed (Arundo donax L.) to give furfural, levulinic acid and lignin derivatives,” It. Pat. Appl. FI 2009 A000210 (29/9/2009). Sluiter, A., Hames, B., Ruiz, R., Scarlata, C., Sluiter, J., Templeton, D., and Crocker, D. (2008a). Determination of Structural Carbohydrates and Lignin in Biomass (NREL/TP-510-42618), National Renewable Energy Laboratory, Golden, CO.
Sluiter, A, Hames, B., Ruiz, R., Scarlata, C., Sluiter, J., and Templeton, D. (2008b). Determination of Extractives in Biomass (NREL/TP-510-42619), National Renewable Energy Laboratory, Golden, CO.
Slutier, A., Hames, B., Ruiz, R., Scarlata, C., Sluiter, J., and Templeton, D. (2008c). Determination of Ash in Biomass (NREL/TP-510-42622), National Renewable Energy Laboratory, Golden, CO.
Verborgt, J., and Webb, A. A. (2007). “Diols formed by ring-opening of epoxies,” U.S. Patent No. 7241504. Zhang, X. D., Bertsch, L. M., Macosko, C. W., Turner, R. B., House, D. W., and Scott, R. V. (1998). “Effect of amine additives on flexible molded foams properties,” Cell. Polym. 17(5), 327-349. Article submitted: December 9, 2016; Peer review completed: March 12, 2017; Revised version received and accepted: March 21, 2017; Published: March 29, 2017.